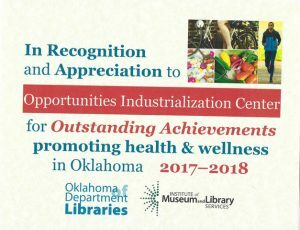 OIC of OKC receives recognition of Outstanding Achievements for promoting health and wellness in Oklahoma On average 10 learners in every classroom don’t have access to nutritious and affordable healthy meals. Food insecurity is a systemic problem in OKC and OIC is not excluded – we struggle to feed our families healthy meals. For many of our students, the healthiest meal they eat during the week is provided by the federal food stamp program (SNAP) Today government assisted food programs like SNAP ARE BEING DE-FUNDED. Many hard working people are reliant on schools, food banks, churches for food assistance. Health education programs teach sustainable life skills which promote health literacy throughout our community. 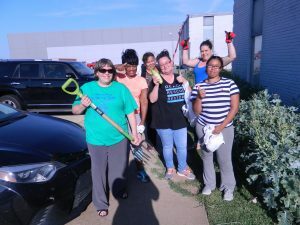 We have plans to expand our health literacy programs next year by partnering with OSU master gardeners and eventually building out our space to include a fitness room. OIC health literacy programming prevents hunger, generational poverty, and chronic diseases within our community. Please consider making a donation to OIC today! Your support will helps us grow our programs. We need your donation today to fuel our future tomorrows.